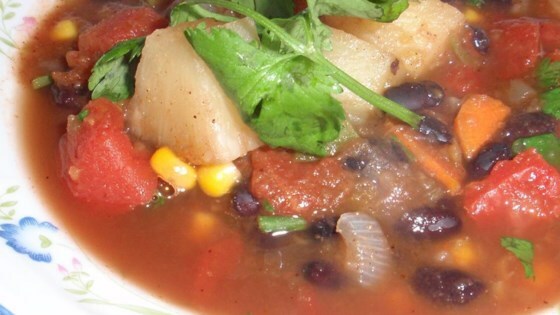 "Quick and easy soup with lots of veggies and original tastes with the pineapple and pumpkin. Serve with hot corn tortillas to eat on the side. Enjoy!" Set oven rack about 6 inches from the heat source and preheat the oven's broiler. Spread corn and pineapple onto a baking sheet. Broil corn and pineapple in the preheated oven until lightly browned, 2 to 4 minutes. Remove from oven. Heat olive oil in a skillet over medium heat; cook and stir onion, mushrooms, yellow bell pepper, carrot, garlic, chili powder, oregano, cumin, salt, and pepper in the hot oil until softened, 10 to 15 minutes. Combine roasted corn-pineapple mixture, onion mixture, vegetable broth, tomatoes, pumpkin puree, black beans, coconut milk, and cilantro in a large pot; bring to a boil. Reduce heat and simmer until flavors have blended, 10 to 15 minutes. Garnish each serving with Cheddar cheese. Shake up your chili game with pumpkin power. There are lots of other ingredients that can be switched in and out. Switch coconut milk out for regular milk or skip the milk altogether. Other options include adding green beans, asparagus, or chicken. I omitted the mushrooms and forgot the coconut milk. It tasted good! I quadrupled the recipe for a chili cook off the Saturday before Thanksgiving.